This application note provides a general understanding of Desert Aire's approach to determining the sensible and latent loads of indoor farms. The approach supports Desert Aire's design of climate control solutions that create optimum conditions for plant development and for indoor farms to operate at the highest efficiency. As part of in-depth facility planning, the proper determination of loads is critical to correctly sizing climate control systems at the lowest initial costs. Industrial cultivation and indoor farming facilities create very unique and difficult challenges to the design of indoor climate control and HVAC systems. These facilities have diverse, specific requirements for humidity, temperature and airflow control that change as plants develop; and according to the types of crops being grown. To design and specify solutions that respond to and control space conditions efficiently, Desert Aire employs a comprehensive approach. Desert Aire begins with an understanding of how a plant impacts sensible and latent loads in a space. To feed itself through the process of photosynthesis, a plant that is exposed to light converts water and carbon dioxide into food. Through another process called transpiration, plants use water to carry nutrients throughout their tissues then release this water as water vapor via tiny openings in plant surfaces called stomata to the surrounding, boundary layer air (Refer to Figure 1). This exchange of gases is driven by the temperature of leaves and their internal vapor pressures; and the vapor pressure being exerted on leaves by the boundary layer air. The process of changing internal liquid water into a gaseous state consumes energy. For indoor grow rooms the sources of this energy are lighting systems. The indoor farming industry uses the term Vapor Pressure Deficit (VPD) when referring to one of the forces that drives transpiration. From a moisture load calculation and modeling perspective Desert Aire uses the term Vapor Pressure Differential. Using the latter term facilitates in-depth discussion among indoor climate control planners of the design rating points that should be used for a specific crop and the surrounding air, within the wider context of an indoor farm’s support systems. Gases and liquids move from areas of high concentration to low concentration. Vapor pressure differentials drive transpiration and provide the force for nutrients to be brought from roots to the upper areas of the plant. Because the vapor pressure inside hydrated plants and their stomata is high, water vapor will exit the stomata if the air outside of the leaves has a lower vapor pressure. The temperatures of leaves impact their internal vapor pressures. As the temperatures of leaves increase at any given air temperature and relative humidity, transpiration rates through stomata tend to increase. Water is essentially evaporating within the plant, absorbing heat while the phase change occurs between liquid and vapor. In this way plants regulate their internal temperatures. The water usage from this process is beneficial for plant growth unless plants are not able to conduct enough water from their roots to their stems. If not enough water is available at the leaves, heat stress and damage will result. Close control over the vapor pressure differential between the surrounding air and plants is critical to creating the most beneficial conditions. Because plants rely so heavily on water to create food during photosynthesis and for transpiration, approximately 99% of water delivered to plant roots travels up through the plant before passing through stomata to become water vapor – and become a latent load that must be controlled if plant processes are to be facilitated on an ongoing basis. Thus, simultaneously controlling and responding to temperatures and relative humidity from the perspective of the plants is a key component of Desert Aire’s GrowAire™ series of climate control systems. The heating load is the amount of heat energy that must be added to the grow room space to maintain a target air temperature level. This is often considered the heat loss calculation as it calculates the level of heat that must be added to offset the loss through the building’s ceilings and walls. This heat loss is especially significant in the winter when the outside temperature is much lower than the inside temperature. The cooling load is the amount of heat energy that needs to be removed to attain the target indoor temperature. This is the heat gain calculation with heat from lighting systems being the most significant portion of this load plus some contributions from solar gain and the building envelope. The moisture load is the amount of moisture that needs to be removed to attain a target moisture or dewpoint level. The moisture load has three components: transpiration from plants; evaporation from soil, irrigation systems and grow room wetted surfaces; and the moisture content from ventilation air. 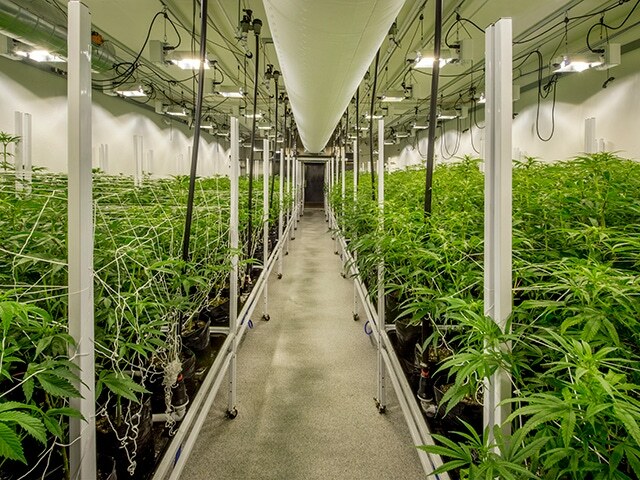 To calculate heating, cooling and moisture loads to specify and size grow room climate control equipment, these loads are expressed as sensible and latent. Sensible heat loads are analogous to the heat building occupants feel on their bodies and are temperatures that can be measured by a thermometer. Latent heat loads are the energy and heat stored in humidity, a product of its change in state from liquid to gaseous. Once determined, Desert Aire engineers combine sensible and latent loads to provide design rating points for the total grow room climate control system. As noted above lighting systems are usually the largest part of the sensible loads in indoor farming facilities. When lighting systems are in lights-on modes, plants convert light energy into the food they need to grow and exchange gasses with the surrounding air. The most direct method of determining the moisture load in a grow room is to calculate the net water usage of plants. In theory this can be accomplished by measuring the volume of irrigation water added to the grow room less the volume of water that exits down the drain. The difference is the volume of moisture that is transpired or evaporated from plants and the growing system. However, this method would require the irrigation system to be in an active mode while appropriate measurement devices record data. To make the calculation of sensible and latent loads more practical for the specification of grow room climate control systems, Desert Aire engineers modified a version of the proven Penman-Monteith formula. The Penman-Monteith formula has evolved over the past 50 years and is an important worldwide tool in traditional outdoor agriculture for estimating evapotranspiration, the combination of evaporation and plant transpiration processes where water changes state from liquid to gas. Just as agricultural engineers and scientists introduce localized data and specific crop properties or coefficients into the formula for their purposes, Desert Aire engineers modified the formula to provide a guide to estimating the latent load in a grow room space and the resultant evaporative cooling effect when exact watering rates are not known. Additional key variables that impact evaporation are the actual crop canopy size at full growth, the space temperature and humidity values, and the number of hours lighting systems are on. Once the reference crop value is known, then it must be converted into a rate for the particular crop being grown. Desert Aire calculates one value for emergent plants to determine the evaporative cooling credit and a second value for the peak moisture release of full-grown plants. As described above, Desert Aire uses the Penman-Monteith formula to determine evapotranspiration rates in both the low plant canopy and high plant canopy phases. Low canopy is the aboveground collection of individual plant crowns when plants are in their immature, shorter stages of development; high canopy refers to when crops are mature and at peak height. The formula is of particular use to Desert Aire during low canopy phases. Our engineers regard the formula as a means of more precisely estimating the lowest evapotranspiration rate in a healthy grow room. By using the formula Desert Aire avoids overestimating the evaporative cooling effect of evapotranspiration that occurs at low canopy. This also provides a safety factor by conservatively estimating the sensible cooling effect created by evapotranspiration as plants grow. During high canopy, Desert Aire calculates the latent load based on owner/operator projections of water usage. The formula provides a supporting method of estimating and verifying the latent load when compared to the actual water usage given. The bottom line for grow room climate control systems is that as plants develop they change the amount of moisture they release. The lighting systems of grow rooms create different levels of heat depending on whether they are in on or off modes. Climate control systems must have the ability to meet the challenges of these changing conditions. When the plants are small, with a low canopy, the evaporative cooling effects of the evapotranspiration that occurs will also be low. With the lights on, the sensible heat ratio (SHR) of the cooling equipment should be moderately high, greater than a 0.75 SHR. This moderately high sensible heat ratio can be achieved with almost any typical air conditioning unit. A problem occurs in the lights-off mode when the standard air conditioner meets the very low sensible demand and turns off before the latent moisture can be removed. However, when the plants have grown, and the room is at high canopy, then the evaporative cooling effects of evapotranspiration will be high and the sensible cooling requirement will be greatly reduced. This is because plants use the ambient heat in the room to convert water into vapor through transpiration. In the lights-on, high canopy scenario the design sensible heat ratio of the air conditioner units is now at a medium-high, 0.50 SHR to 0.60 SHR level. Typical air conditioning units will achieve temperature setpoints rapidly and index off. Without the units operating, the moisture loads (latent) will increase. In the lights-off mode, the same problem occurs as with low canopy plants. One rudimentary method of dealing with this variable sensible heat ratio is to have a set of HVAC equipment that is sized for handling the high sensible load during the low canopy period. Traditional portable dehumidifiers are used to offset high latent loads during the high canopy period. Although it is possible to size such a system, there will be periods where sensible load is added by the dehumidifier and needs to be removed by the air conditioner. This combination is both difficult to balance and significantly inefficient and may result in higher equipment and energy costs. The advanced, more efficient method Desert Aire uses is to design a single integrated platform that modulates sensible heat ratios in response to the demands of grow rooms. When grow rooms have high sensible heat ratios then the majority of energy removed is sensible. In periods of low sensible heat ratios the majority of energy removed is latent. The specification of water-cooled and LED lighting systems may impact the design rating points of equipment that will modulate sensible heat ratio requirements. Because these lighting systems can produce sensible loads at levels up to 50% less than air-cooled lighting technologies, the climate control systems they are teamed with may need to produce an extremely low sensible heat ratio with lights on. Indoor farming facilities have diverse, intense requirements for humidity, temperature and airflow control that change as plants develop. To design and specify solutions that respond to and control space conditions efficiently, Desert Aire employs a comprehensive approach to determine the loads indoor climate control systems must monitor and manage. This comprehensive approach ensures the recommended solution is properly sized to reconcile changing biological processes with lighting and crop support systems. Please contact your nearest Desert Aire Representative for assistance in determining your grow room loads and the design of your indoor farm’s climate control system.